What is involved in a boiler service? A thorough inspection your boiler and controls to make sure they are operating safely. This includes checking your boiler for corrosion and leaks. The boiler casing is removed to check the function of its main components. A gas pressure check will ensure your boiler is ope rating at the correct gas pressure. Where possible a flue gas analysis test will ensure that no unsafe emissions are being released from your boiler and that it is working efficiently. Boiler’s parts are cleaned as needed. A Gas Service Sheet is printed out on site or a PDF copy emailed to our clients listing all the necessary information about the safety of your boiler. What is the difference between a boiler service and a gas safety inspection? A gas safety inspection can be likened to a car having an MOT. All gas appliances within a property are inspected by our fully qualified gas engineer to ensure they are in safe working condition. Gas safety inspections are an annual legal requirement for landlords in the UK. Please see the Gas Inspections page of our website for more details on these. 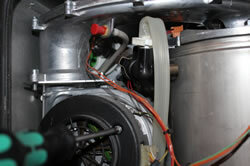 A boiler service can be likened to a car being serviced. While not a legal requirement, regular boiler servicing is vital to ensure that your boiler is running efficiently and safely. Manufacturersrecommend annual servicing to prolong the life of the appliance. Poorly maintained or faulty boilers can be a serious health risk to you and your family, because they can cause fatal carbon monoxide poisoning. A boiler service generally takes anything between 20-40 minutes. However it may be wise to allow 60 minutes in your schedule.